Opening the ankle or plantarflexion can put some temporary pressure on the tips of the skis, at the expense though of moving the hips back or reducing the body's forward momentum (forward along the skis). It is also used in an extension release++ and if you use it a lot, a sign that you're chronically back on your skis! Closing the ankle or dorsiflexion is an important movement or action of the ankle. It is (partially) responsible for getting or staying forward, in fore-aft. Biomechanically, it also allows better tipping and it's complementary in a flexed release. You can also see, in the photo above, that dorsiflexion would be part of adjusting fore-aft along the outside ski as well. Dry-land practice must include a lot of attention to this movement, developing both static and dynamic balance. Thinking about the Dorsiflexion and plantarflexion, when do we tactically use them for what purpose? Primary use of dorsiflexion and plantarflexion is in adjusting fore-aft. Of course, this is a limited range of movement, so it's just a compensation mechanism or complementary, when the body is slightly back on skis. We cannot put a lot of pressure with plantarflexion, when the body is back, because that will cause the upper body to get even further back. Plantarflexion can be used for compensation - i.e. if you send the feet too much to the side and you risk losing the tips of the skis, you can use some plantarflexion to create/maintain some tip pressure while the skis come around. Also, maintaining a feel for the sow: pressing the toes down somewhat will help with maintaining a feel for the snow and the tips/edges engaged even when the body is back. As mentioned above, that would be a very quick and temporary adjustment though, otherwise the skier risks getting out of balance to the rear. Plantar flexion is associated with the beginning of the turn, this is when we're looking for tip pressure. At the same time, do consider that a constant need for plantar flexion at the top of the turn may be an indication of chronically being too far back on the skis! Has beneficial effects in general, in helping to bring or keep the boots back and/or hips forward, so it is used quite a lot - in fact racers tibialis anterior (the muscles primary responsible for dorsiflexion) are very well developed. It is perhaps important to note that although the ankles and the lower leg muscles are strong, there isn't enough leverage to move the body, at least not quickly fore/aft only from the ankles, i.e. only from dorsiflexion alone. Dorsiflexion keeps shin pressure on the boot tongues, usually associated with being forward - but that's also dependent on the flexion/extension state of the leg at the knee and hips. It also is integral part of and works together with pulling the boots back, which is a stronger movement for fore-aft. 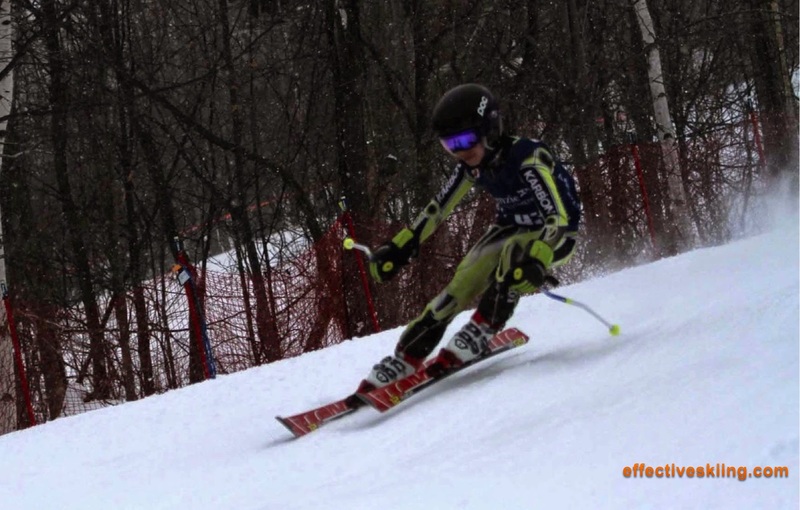 Dorsiflexion is associated with the transition, when the skis are brought back under or kept under the hips as well as getting forward in the beginning of the turn, to apply pressure on the tips of the skis and start carving. The cuff forward lean angle influences the range of dorsiflexion and plantar flexion: more forward lean allows more dorsiflexion and less plantar flexion. It is often thought that a skier must be able to bend the boot to get forward or to engage the tips of the skis - in reality, that's not required. In fact, if a skier needs to constantly bend the plastic cuff to get forward enough to get good pressure, likely the boots are not setup properly++ fore/aft. Here are some experiments you can easily do at home, to better understand the implications and uses of these movements. If you do these in boots and the boots in skis, then you can use a lot bigger ranges of motion and the result will be more similar to that on... well, skis. Stand up. Move weight (pressure) on the ball of the feet. Now dorsiflex, i.e. pull up the ball of the feet. The result will be that you get more forward. Stand up. Put your feet under something that will keep them flat (under a couch or a bed or something. Now dorsiflex, i.e. pull up your feet. Since the feet are locked flat, the result will be moving the shins forward. This is similar to using the boot: while dorsiflexing inside the ski boot, the feet will be stopped by the boot and the result will be moving the shins forward. Note that another side effect of dorsiflexion is perhaps a little more pressure on the tails of the skis, while the body comes forward. Stand up. Move weight to the ball of the foot. Now plantarflex i.e. push your foot down like on a pedal. The result is increased pressure on the ball of the foot but also the body moving back. Stand up. Move weight on the heels. Now plantarflex i.e. push your foot down like on a pedal. The result will be getting out of balance to the rear. This shows you how you can use plantarflexion to put some temporary pressure on the tip of the skis - the more forward you are and the more forward momentum the body has, the more this can be sustained. During a good ski turn, plantarflexion is a good compensation mechanism, which you can use to manage pressure on the tips of the skis and also adjust fore/aft. Viewed 2756 times ( | Print ) this page.